Mind Yuh Business returns to the Dex in Brixton in December, with special live guests, the seven-piece Frank Popp Ensemble. 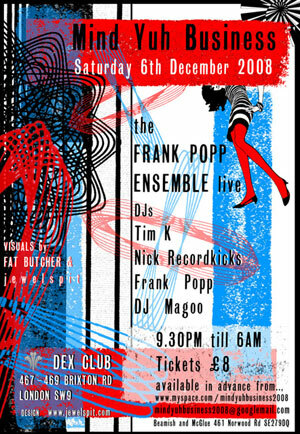 Behind the decks will be Frank himself, as well as Nick from the Record Kicks label, Tim Keenoy and DJ Magoo. Tickets are £8, the date is Saturday 6th December and the venue is the Dex Club, 467-469 Brixton Road, London SW9.